Family owned and globally known, Godwin Manufacturing Company started from humble beginnings. On April 1, 1966, Pat Godwin came home from work and told his wife, Judy, that he had delivered his last case of soft drinks as a route salesman for Pepsi Cola. Judy yelled, "April Fools!" Pat said, "It may be April fools Day, but I will not be going back." They had two toddlers in diapers at that time, and realizing he had quit a good, steady job, Judy cried for weeks. Judy had a job as a cashier at a local grocery store, and when she left for work each day, Pat would unplug the electric stove and plug in his welder that was situated in a detached garage. The business grew to what it is today, the nation's largest and most successful family owned and operated truck equipment manufacturer, with nearly half a million square feet under roof. Pat Godwin Sr. starts Godwin Welding Service in his backyard after quitting his job. Godwin Welding service moved to its current location on Hwy 421 Dunn. Godwin quickly increases sales and its workforce. Godwin Welding service becomes Godwin Manufacturing Co., Inc.
Godwin expands to begin manufacturing hydraulic hoists. During this time, the company undergoes a massive expansion. Business North Carolina names Godwin a Top 5 Employer. 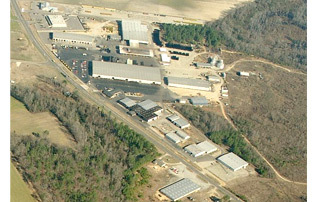 Godwin builds multimillion dollar state of the art powder coating facility. Godwin Manufacturing purchases competitor R/S Truck Body Co.
Godwin announces the purchase of longtime competitor Galion Truck Body Co. The Godwin Group is created to streamline purchasing and accounting for all companies. Godwin hoist popularity leads to the creation of Champion Hoist & Equipment Co. which shares a 250,000 square foot facility with The Godwin Group offices. Godwin Manufacturing announces the purchase of snow equipment manufacturer Good Roads.